Brigadier Wingate and his Head Quarters reached the eastern banks of the Irrawaddy River on the 29th March, and looked out over the wide expanse of water with trepidation. As columns 7 and 8 joined them on the shore line, the commanders discussed the best way forward in getting their men across this menacing obstacle. Some boats containing men from column 7 began to make their way over, when suddenly from the far bank shots were heard as these boats came under attack from a large Japanese patrol. Most of the Chindits in the river were killed or drowned, but some made it over and quickly disappeared into the jungle beyond the western shore. Wingate and commanders Scott and Gilkes decided that the only option open to them was to withdraw, and they too melted away into the scrubland from whence they had just come. Gilkes and Scott decided to march away from the location almost immediately, but Wingate decided to find a well concealed bivouac in the nearby woods and wait until things had settled down. (Pictured left is the Chindit leader, seen looking out over the obstacle that was the Irrawaddy River). During this time, which went on for about a week, Wingate prepared his group for dispersal. He also decided to relieve the men of all the larger weapons and equipment in order to make their journey back to India as quick as possible. The other decision made was to kill all the remaining mules, butcher them to supplement the depleted rations and to build up the men's strength with this newly acquired meat. Being, as always, a man of action, Wingate helped with the silent execution of the long suffering, but ever loyal mules. I am writing to you in relation to the post you placed on the Burma Star website regarding your father’s Wingate documentation. Firstly, I was wondering if you still have the paperwork in your possession. I am interested in the contents of these documents because I am trying to research the war record of my maternal Grandfather Arthur Leslie Howney. He was a Private in the first Chindit operation ‘Longcloth’; this as I am sure you are aware, is the operation that your documents pertain to. Can you tell me if there are any soldiers names mentioned within the reports? It is rare I know for ordinary ranks to be mentioned in these types of papers, but you never know. Do you know if the documents are available to read at any of the archive establishments? As I say I am extremely interested in the content of the papers you hold, and would be grateful if you could tell me of there general content and perhaps if my Grandfather or other soldiers are mentioned. I recently visited Burma on a trip arranged by the British Legion. This was a fantastic experience, which took me to various Chindit locations and culminated with an emotional visit to Rangoon War Cemetery, where my Grandad is buried. The reason that I am writing to you is because the email contact on the website does not seem to work. This is probably because you have changed addresses. It is not possible to tell how old some of the postings on the site are. I have helped quite a few people with their enquiries in relation to the Chindits; these include a lady in Zambia who is researching her relative Captain Graham Hosegood of the 13th Kings Head Quarters. He too did not return to the UK after the war. If this letter does reach you, then I have to thank Phil Crawley at the Burma Star, who will have forwarded this letter on. I hope you do not mind me reaching you in this way, and thank you for your kind attention with this matter. Here is the transcription as written by Colin Neale, showing the dispersal diary of Brigadier Wingate for 1943. I have reproduced the document exactly how Colin presented it on the Burma Star website, the numbers you see next to Burmese place names are I believe map co-ordinates. Pictured above is a photograph taken sometime during the first week in April that year, when the men were concealed in the jungle close to the Irrawaddy River and consuming their mule steaks. Diary of Brigade Cmdr’s dispersal group from time Bde. H.Q. split up by dispersal groups on 30/3/43 to the crossing of CHINDWIN on 29/4/43. Bde. H.Q. had successful S.D. in area of KYAUK TAUNG SN 2162 and after an address by the Brigadier split up into five dispersal groups commanded respectively by The Brigadier, Major Conron, Capt Hosegood, Capt Moxon and Capt Paton. The split up took place in the afternoon our party after watering on the NALO CHAUNG went into bivouac for the night about half a mile away from the Chaung (the Burmese word for river or stream). We still had eight mules, and one horse. A W/T set was carried. Moved bivouac to upper waters of TOKPAN CHAUNG with intention of remaining there for five or six days to regain strength and allow situation on Irrawaddy to settle down again before attempting a crossing. Our W/T (wireless transmitter) had sent a final message to Corps the previous day and the station was now closed with the exception that we received the News as long as the battery lasted. Our bivouac was shady and pleasant but we had to dig water holes. We accordingly went into bivouac for the night. The changed plan was to move SOUTH the following day towards spot height 1271 SM 8125 from which to observe the IRRAWADDY with a view to crossing at INNET. In the early afternoon we descended on MAUNGGON and eventually with local aid found two boats in a backwater. Later we stopped a third boat which was moving upstream. We began crossing about 1530 hrs but when half the party was over automatic fire was heard from the NORTH and our native boatmen made off with the boats leaving half our party on the EAST bank. The Brigadier’s party then consisted of B.C; Brigade Major, Jefferies, Aung Thin and Katju with 24 other ranks. We had apparently landed on an island and we immediately pushed on towards NYAUNGBINTHA where we got a large boat and crossed at dusk. We lay up for the night about 2 miles N.E. of NYAUNGBINTHA. The mosquitos were intolerable and we got little sleep. (It was at this point that things began to go wrong for the dispersal groups within the Brigade HQ and the men became separated still further). We had left our lying up bivouac with about 5 days carefully hoarded hard rations and in this village we got an ample supply of rice. Later in the day we moved NORTH along the foothills and at dusk crossed the TAWMA motor road. The Japs were reported to be at TAWMA. Seen to the right is a rare photograph of some Gurkha Riflemen from Operation Longcloth. These are some of the men from Wingate's personal bodyguard in 1943, seen with their commander Lieutenant L.W. Rose (sitting) just before dispersal was called. (Click on image to enlarge). Followed in WABO CHAUNG WEST towards DOBIN-YWA then struck NORTH by track. Good going. We approached the railway line with great care our main trouble being the noise caused by treading on dead leaves. We crossed the railway. Successfully about 2 ½ miles EAST of NANKAN R.S. and bivouacked on a chaung about SM 5175. Crossed NANKAN motor rd. and struch WEST into hills. No recent traces of M.T. on rd. We were very exhausted today and found the going too much for us so we descended the mountains again and spent our mid-day halt on the SEYWA CHAUNG at SM 5278. During the night of 14/15 we moved very quickly NORTH by track and farmed the village of PINKA - AIK SM 4986. We got a young buffalo in this village and we made off to cook our spoils in a small chaung SOTH of SHINPA SM 4988. We learned that the Japs had been in PINKA – AIK the previous day and we had the satisfaction of taking a large number of chicken which had been reserved for the enemy. At dawn on the 15th we moved into bivouac 1 mile SE of SHINPHA where we spent the day and night 15 / 16. During this march Spurlock who had been failing for some days with dysentery had to fall out near KYINGI SM 4995. On the morning of 17th we went into bivouac on the KWELON CHAUNG. (Ken Spurlock was later taken prisoner by the Japanese and spent two years in Rangoon Jail). Here we spent a very hot and uncomfortable day. There were signs that native labour is being used in this area for road building. Signs of work were seen in a paddy field near NAUNGMALIN. In the evening we moved through YESHIN, where we obtained fresh fruit, and made bivouac for the night on a small chaung EAST of the NANKASA CHAUNG. Followed down the SHWEGYN. Going abominable because of cut bamboo blocking the chaung. Crossed MU river, which is easily fordable and entered MUTHA SF 9608 thereafter WEST to LETHAGON, which we farmed and into bivouac for the night. S.E. of MAGYIGON SF 8408. This was a long and tiring days march. (Around this time the group was met by a local villager, a kind of hermit, who led them on for a considerable distance, Wingate had made the risky decision to trust this man, which as it turned out was an inspired choice). Pictured left is Sgt. Carey, he was one of the men who swam the Chindwin River on the 28th April with Wingate, as the group finally reached the safety of India in 1943. Entered PINMAUNG for fruit. We then intended to move across country over the escarpment but outside this village we met a providential guide who lead us over the escarpment by a very quick route which is however unsuitable for animals other than elephants. We intended to reach THETLA SF 6108 the following day and by late afternoon we were on the THETLA CHAUNG some seven miles from THETLA. After crossing the escarpment we had followed the line of the KYAUKPYA CHAUNG which is much used by Salt sellers. These salt sellers gave us good information about both Jap and British positions on the CHINDWIN. They stated that a British force of 300 had been EAST as far as THETLA and that the British were still on the EAST bank of the CHINDWIN. In fact this information was a few days old and no British troops were now on the EAST bank. Moved through THETLA on to INGON SF5611 and went into bivouac 2 miles EAST of the latter village. We were all very exhausted and urgently in need of rest so accordingly remained in bivouac in this area the following day 25/4. Meantime we had collected some rice from INGON and also another guide. The guides stated our best chances of crossing the CHINDWIN were a MYAING.U SF 3605 where they said there were no Japs and boats were available. At dusk on 25/4 we moved off WEST, via SHWEDIGON and KYEBIN and made bivouac for remainder of night SOUTH of KYA-IN. Moved S.W. on to a tributary of the TAWET CHAUNG where we lay in hiding for the day. The guides meantime went off via WUTKYAING to make arrangements for boats. They returned at dusk stating that the Japs patrolled through MYAING-U but that they thought we should make an attempt that night. We moved off towards WUTKYAING which the guides entered to find the lay of the land there being Jap agents there. We remained a mile outside till 0300 hrs 27/4 by which time the guides had failed to return probably because they had taken fright. (The local guides could well have become unnerved at this time due to the capture and execution of Pte. Robert Weston. He had been separated from the main party and caught close to the village track by the Japanese, who then proceeded to make an example of him to the villagers by bayonetting him to death as they looked on). We moved off again and by 0900 hrs 27/4 were in hiding NORTH of INGYINTHA SF 4207. Our general condition was now one of weakness, we had little food, and our boots were worn through. It was thus impracticable to attempt a crossing further NORTH because of the length of march. We decided therefore to attempt a crossing on the large sandbank lying SOUTH of MINYA SF 3208. The Japs were known to be at THAYAUNG and PAUNGBYIN and between these two points there were patrols. 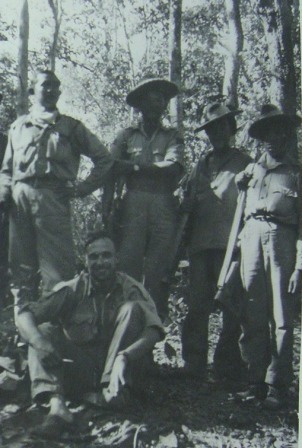 The plan was to send across a small party, composed of the Brigadier, Jefferies, Aung Thin and 2 ORs (Sgt. Carey and Pte. Boardman), who would arrange boats for the remainder who were under command of Anderson. At 1730 hrs on 27/4 the whole party made off towards the river. We crossed the motor road. from PAUNGBYIN running NORTH but then struck almost impossible country. Two hours of darkness only remained so accordingly the main body under Anderson retraced steps EAST while the Brigadier and his four swimmers pushed on with a few to arranging boats for the night of 28/29. The swimming party after awful going through long grass eventually reached the river by 1200 hrs and at once crossed. They later contacted a Company of Gurkhas under Major White NORTH of MINYA and arranged boats for the non-swimmers. Actually the non-swimmers still had four or five good swimmers from 142 Coy. And were lying up for the day near INWAING. In the late afternoon they moved off and found frequent tracks of Japanese patrols both in the jungle and on most tracks. (Difficult going was an understatement, as Wingate, Jefferies and Aung Thin all nearly drowned). After very bad going the CHINDWIN was reached at 0400hrs. 29/4 . The recognition signal was made but not answered so the remainder of the swimmers were sent over. The rest of the party under Anderson went into hiding a mile from the river in elephant grass. At 1830 hrs. Capt. Katju was shot, believed killed, while entering a small village to contact our Buriff Havildar who was trying to arrange boats. The party returned to the river by dark, made the recognition signal which was answered at once and a boat was promptly pushed over and took the party off. About one minute after leaving the EAST bank the Japs arrived there and opened fire with dischargers and automatic fire. (Captain Motilal Katju had indeed been killed in the village, lost with him was his important 'Longcloth diary'. Katju was acting as an official observer on the expedition and had kept a very detailed account of the operation, this unique document was never recovered). So, there you have the events of Wingate's escape from Burma in April 1943. There have been many comments made about his decision to split his HQ up into five separate groups, the choice of personnel to accompany his party and of course the somewhat heartless way he left behind men like Lieutenant Ken Spurlock, when they could no longer keep up with the main group. However you might look at these factors, it is difficult to argue with the common sense element behind these decisions, as it would have been unthinkable for the main Chindit leader and developer of the idea of Long Range Penetration not to make it out of Burma that year. My thanks must go to the editor of the Burma Star website, Phil Crawley and to Colin Neale (who I still hope to contact one day), for their massive contributions to this story. 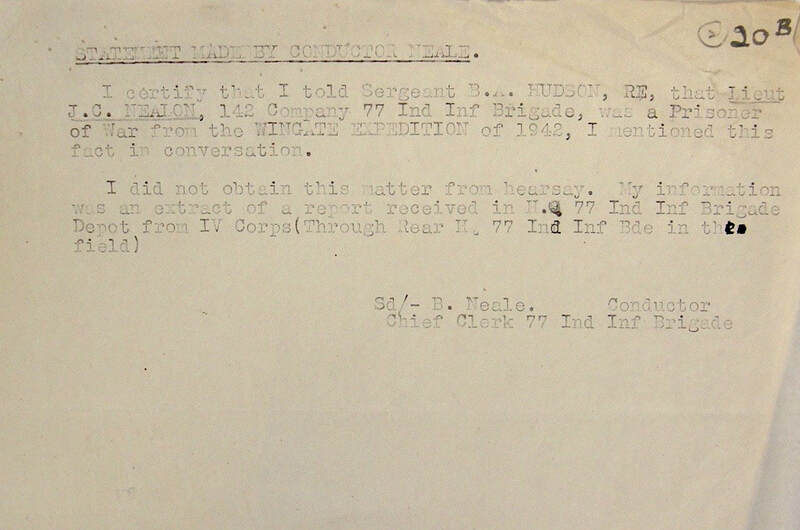 As a visual sub note to the above article and diary, here is an image of a communique sent by Major Basil Neale later in 1943, when attempting to help with the whereabouts of the various personnel from operation Longcloth who had not made it back. 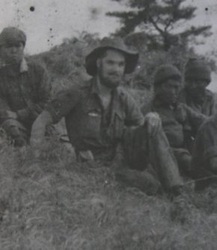 Lieutenant John Nealon was the commander of the Commando platoon from Column 1 and had been captured by the Japanese at a place called Mangyaing on 6th May 1943. Copyright © Steve Fogden and Colin Neale 2012.